If you’re interested in becoming a shooting instructor with certification in the most innovative program in the world of shooting sports, apply to become a teacher of the Coordinated Shooting Method (CSM). Designed by the internationally respected shooting sports instructor John Higgins, CSM involves a systematic approach to teaching shooters of all ages and experience levels. As a method that focuses on achieving measurable results through self-improvement, CSM is unlike any other sporting clays instruction and is unbound by the restrictions of traditional programs. When you become certified to teach CSM, you can take pride in being an instructor of a groundbreaking method that has more research and thorough testing for proof of success than any other program. Shooting is a sport that is growing in popularity, and joining more than 200 other CSM instructors in the U.S. will allow you to help others enjoy this exciting pastime. 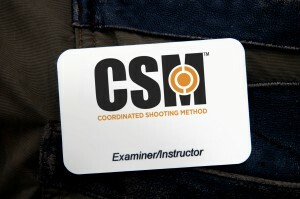 For more information on receiving a shooting instructor certification with CSM, contact John Higgins today.